Meghan Markle's Fave Eco Label + How We Can Afford It. — ecobabe. We want everything Meghan Markle has right? Including her real life as a Princess ðŸ˜© So, itâ€™s no surprise that just like her sister-in-law Kate, whatever Meghan wears in public just flies right off those store shelves + suddenly youâ€™re on a waitlist (or should we call it a que) months long. So where am I going with this? Wellâ€¦. from keeping a tight Royal Watch, Iâ€™ve watched The Duchess stick to the same labels + rock those same designers time + time again. You know what they say: if ainâ€™t broke, donâ€™t fix it. And we DEF donâ€™t want our Royal Fashionista to fix a thing. Especially since one of those labels sheâ€™s loyal toâ€¦ is ECO. Remember Meghanâ€™s stop-in-your-tracks reception dress? If youâ€™re not familiar with Stella McCartney, she is who we credit for paving the way in high end sustainability. Stella believes in circular solutions, where clothes never end up as waste. The British designer also uses many recycled materials throughout her collections + is always cruelty free. In fact, I believe McCartney was one of the first fashion houses to swear off fur + develop a substitution thatâ€™s just as good as the real deal. And OMG you should see her â€˜skin free suedesâ€™ + buttery faux leathers. And yes, Stella is the daughter to Sir Paul McCartney. I just wish we could all afford this celeb-loved label to have our own Stella McCartney moments! Well, guess whattttttâ€¦. âœ–ï¸�If you want that Markle Spakle + the 50% off sale section on StellaMcCartney.com is still too steep, do what I do + rent these tailored-to-perfection pieces from Rent The Runway! Click here for $30 off your first rental. âœ–ï¸�Now, RTR doesnâ€™t always have Stella McCartney on hand, so your sure choice is to peep Poshmark. There, youâ€™ll find Stella McCartney pieces for sale at very affordable prices. All the items are either lightly used + still in new condition, or brand new out of the box. And they range from shoes to dresses to denim to lingerie. âœ–ï¸�The same goes for The Real Real. You can find some real incredible deals there. 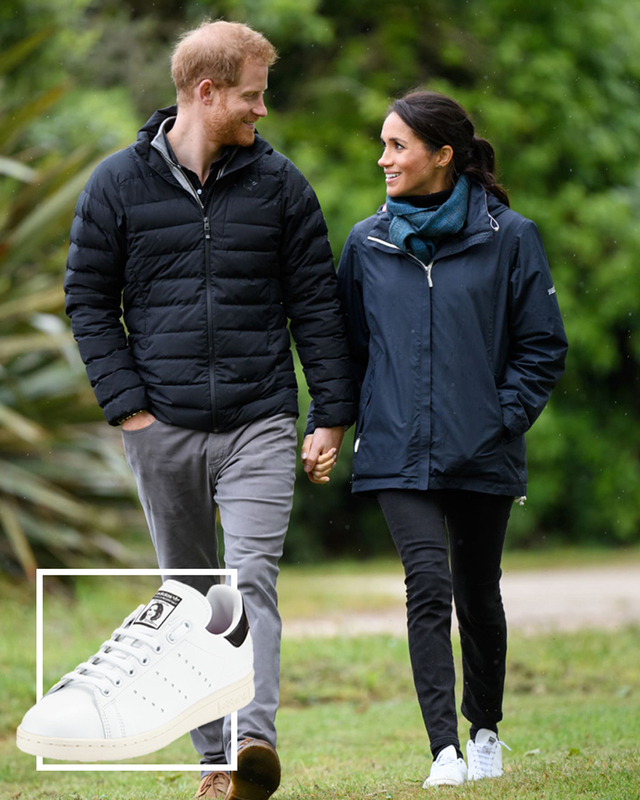 âœ–ï¸�And if youâ€™re looking to actually twin with The Duchess, you CAN by grabbing her exact same Stella McCartney x Adidas sneakers. Just click the photo! I absolutely love Stella McCartney for making sustainability chic + beautiful. I always look to her for Inspo while going green (in style) + I know you will too!! Letâ€™s also give a royal round applause to Her Royal Highness Meghan Markle for supporting our fave eco-luxe designer time + time again! Let me know if you end up trying any Stella Mccartney pieces yourself! Would love to see a pic or two. And babes, do you like this type of content? To me in a world of constant bad news, itâ€™s fun + itâ€™s something different. But please tell me! If you do, Iâ€™ll be sure to share more.